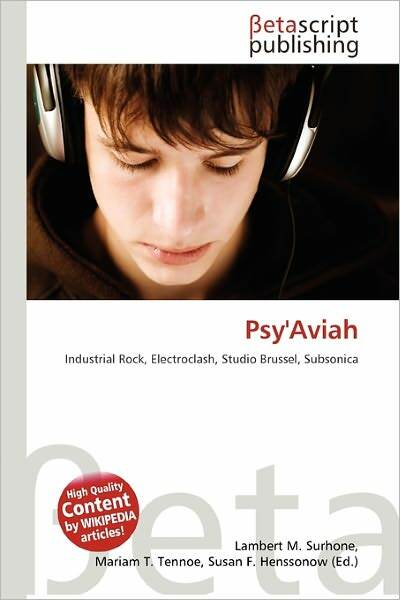 In late July, Belgian electronic act Psy’Aviah was made aware of a biography on their band that had been making its way through stores digital and physical. Released by Betascript Publishing, the biography was never endorsed or authorized by Psy’Aviah; in fact, they had no knowledge of its existence up to this point. The Betascript biography turned out to be nothing more than the content from the Wikipedia article on Psy’Aviah lifted, printed, and sold. To this date, multiple electronic acts such as VNV Nation, Front 242, and Apoptygma Berzerk also have unauthorized Betascript biographies being sold. Reportedly, Betascript is a subsidiary of Germany-based VDM Publishing, which controls numerous publishing companies of similar nature. This sparks a very important question: IS there any legal argument here? With ethics being such a difficult field to argue (one need only take a Philosophy 101 course to know that), is there any legal ground here to dispute? Betascript has thus followed the law of the license directly. They are reselling material that they were allowed to take, and they are doing so with a giant sticker on the front that identifies the source as free, online resource Wikipedia. Quite frankly, there is a particular lack of sympathy for anyone who willingly purchases something that they are told upfront can be accessed on Wikipedia. Now, let’s look at another legal element: The Right of Publicity, or personality rights. Using the prestigious Wikipedia again, along with the consultation of multiple legal advisors and law books, we can define this right as “the right of an individual to control the commercial use of his or her name, image, likeness, or other unequivocal aspects of one’s identity.” This particularly applies if the individual or entity has trademarked its name. Numerous countries embrace the Right of Publicity, including the United States, the United Kingdom, Germany, and more. While the island of Mauritius (the listed base of marketing for Betascript Publishing) does not specifically cite any laws surrounding the Right of Publicity, the homeland of parent company VDM Publishing (Germany) and numerous other nations to which Betascript have distributed their books have laws regarding the tort of appropriations (another name for violating the Right to Privacy and Right of Publicity). In the United States, Betascript Publishing have every right to sell their books, so long as they compensate the subjects (Psy’Aviah, etc. ), as these bands could be making money from their biographies and are not. The decisive question is: are people buying this book believing that it is with the permission of the bands? Ultimately, this is a case of buyer beware. The words “Wikipedia” are on the front of the books. There is no claim to being official in any way. If anyone is looking for an authorized, official biography of bands in this genre, Betascript Publishing – by its own definition – is not the source. It’s important for fans of these bands to do the research; if the bands are promoting their newest biography, chances are it is official. Otherwise, there should be a healthy dose of skepticism. Is the method of obtaining and publishing information legal? Absolutely. Is the act itself, though? Based on the common and civil law of numerous world nations and the bands’ lack of knowledge/consent, it’s questionable. If the bands can make a case that their name is being used to sell these books, then Betascript Publishing (and, by proxy, its parent VDM Publishing) are violating the laws of the nations to which they are distributing these books. When reached for comment, a representative from VDM Publishing simply stated that the books are based on Wikipedia articles and suggested that we contact the authors for further details. No contact information was given for any authors and representatives of Betascript Publishing were unable to be reached for comment. Nice digging! New elements coming up.